That’s the question addressed by a new collection of essays, Still Evangelical? Insiders Reconsider Political, Social, and Theological Meaning. The contributors include the heads of major organizations traditionally tied to American evangelicalism, including Jim Daly (Focus on the Family), Mark Galli (Christianity Today), and Tom Lin (InterVarsity Christian Fellowship), as well as thought leaders like Shane Claiborne, Lisa Sharon Harper, Karen Swallow Prior, and Soong-Chan Rah. The book’s editor, Mark Labberton, president of Fuller Theological Seminary, brought together this group of authors in order to have a wide variety of “evangelical insiders” provide reflection on the theological and social implications of the word “evangelical.” Labberton also contributed an introductory essay framing the book. Morgan Feddes Satre, editor of Advance (and a current student at Fuller) talked with Labberton about his introduction and how the book can help CCCU campuses engage the question. The interview has been edited for length. In your introduction, you talk about how “social location” influences American evangelicalism and can help explain some of the differences we see between conservatives and liberals who also hold traditional evangelical beliefs. Can we learn to see, recognize, and separate out our “social location” views from the truths we study and learn in Scripture? I think that we can never separate ourselves from our own location – it’s like telling a fish to leave water – because it so defines and circumscribes how we live, where and who has formed us, all of that sort of thing. No one lives in a setting that is unaffected by their social location. Part of the gift of the Christian faith and scripture is the possibility, however, that our social location can be disrupted by the Gospel as it intersects with us in our specific context. Yet it is easier and perhaps more common for our context to subsume the Gospel, rather than letting the Gospel transform the way we see our social location and the way we respond. When Jesus declares, for example, in Matthew 4, that “the kingdom of God is at hand,” he is proclaiming that a fresh revelation of the nature of God is breaking in upon Roman authority, into personal circumstances, and into social reality, and recasting all of that. The Sermon on the Mount is Jesus’ expansion on that very theme: “Let me show you a re-ordered life in light of the kingdom of God.” That is meant, I think, to be the catalyst for a re-envisioning and a re-indwelling of our social location, so that we come to where we are with a fresh set of loves, hopes, and commitments. Out of this, Jesus’ followers are meant to demonstrate a new social reality, to enact an embodied experi­ence of the kingdom of God now. The church is not and never can be culture-free. But it is right to expect Christian disciples to live differently within culture. The crisis that this moment in evangelical history has evoked is that evangelical leaders and evangelical culture itself have seemed to drown the very Gospel we are called to pro­claim and enact. For many, the loudest public voices heard to represent evangelicals seem to have sold out to culture, power, or fame. It leaves many thinking that we evangelicals are op­portunists, speaking out of our social location while attributing it to our faith, rather than allowing our faith to reorder and challenge our context and assumptions. So as we wrestle with this – with the word “evan­gelical” and all its social and theological impli­cations, as well as the idea of social location – how can CCCU institutions help their campus communities engage this sort of reflection? This is such an important question – I would say it is the cen­tral question of Christian higher education, because it’s the core of what should distinguish the enterprise. Like any institution of higher education, CCCU schools are committed to the dis­ciplines we study, offering the opportunity for those disciplines to be rigorously engaged and also considered in the light of the Christian faith. I think being a Christian university should open our imagination, heart, and mind toward the world in light of the enormity and significance of God’s revelation in Christ. It should also drive us into even more serious and careful reflection about the implications of our faith in relationship to any given discipline. This is the common work across an institution’s life as it is done distinctly by administrators, faculty, and students. Coming back, then, to the question of social location – it can be that a Christian education again is just a reproduction of a certain kind of subculture, reinforced again and again. We can all just settle into the frame of that social location, or we can ac­tually allow the Gospel to keep waking us up to the vision of the kingdom of God, which is a vision of radical re-creation in and through Jesus Christ. This brings discovery, imagination, and disruption to all we study and how we study it. If we let it, the Gospel cracks open the universe. Christian higher education sails and dives into this reality with faithful­ness, intelligence, creativity, and hope. We inevitably come to the task of education through a particular lens. But if we let education do its great work, it should cause us to have an ongo­ing self-critique of asking ourselves again and again: How are we hearing and seeing the meaning and reality of the Gospel in relationship to our studies, our world, and our lives? For example, Fuller is an institution, as an affiliate of the CCCU, that was founded in Southern California 70 years ago, and it has traits about it that are distinctly Californian, Southern Californian, and strongly white. Those could be the things that drive our scholarship and teaching, but what we strive for is that our teaching and learning should principally be defined by the kingdom of God, which has cat­egories that are dramatically greater, wider, and deeper than those details. We have to start where we are. But the Gospel actually has things to say about an alternative Christian vision of how God sees humanity. How does God see education for the sake of the world, including but not limited to Southern California? How does God see the for­mation of Christian leaders, with a vision toward a world that is much greater and much different than our classical cultural markers? Our institutions need leaders who will seek to engage in careful self-critique and then in redemp­tive hope and transformation. Because it’s not just critique that the Gospel brings – it’s also the vision of a greater, deeper reality that the kingdom of God is about and to which we are meant to devote ourselves. So we should be marked, I think, by a radical humil­ity that can admit our location; acknowl­edge and embrace, but also confess, repent, and lament over the limitations of that; and then open ourselves to the door of a fresh wind of the Spirit that can actually transform our social location to look much more like the vision that Jesus gives us in the Gospels of the kingdom that he’s building. I’m not in any way suggesting this is easy work. But it feels like distinctly Christian and urgent work, that we would want to acknowledge the limits of our location so that we can lean into and be transformed by a vision of the kingdom of God. “Evangelical” is a tag that for many points to self-interested, angry, xenophobic people. No wonder it is so hard for people to recognize Je­sus among us. Clearly the dissonance between the popular/media label of “evangelical” and the theological understanding of “evangelical” is greater than it’s ever been. Do you think it’s possible to “take back” the label, so to speak? Toward the end of the introductory essay that I wrote, I raised the question of whether the real issue is “still evangelical?” or whether it should be a different question: Are we yet evangelical? What I’m trying to get at is a shift between something that could be argued over, like you’re describing, or whether “evangelical” should be understood as an aspirational hope. How do I become conformed to the Evangel – to Jesus Christ? If that’s what we mean by “evangelical” – that I want to be identified in word and deed with the Evangel, Jesus Christ himself, and be transformed into his likeness – then that work remains, regardless of the matching title form of Evangel that might be “evangelical,” or “evangelicals,” or “evangelicalism.” I think those are words that have a derivative value and meaning only insofar as they are an embodiment of the Evangel. The question I believe matters is: Do we seek to live as Evangel-centered people? Are we wanting to live like people who follow Jesus? Or are we going to simply live like people who are trying to barter over the attribution of certain words, “evangelical” and “evangelicalism”? The value of our identity only matters if it is a reflection of Jesus. Do we want to be like Christ? If so, what does that mean for individuals and institutions? This is the central vocation of Christian life. The crisis of the moment is wanting to use the evangelical label and tribe in ways that scandalize and empty the Gospel we supposedly represent. 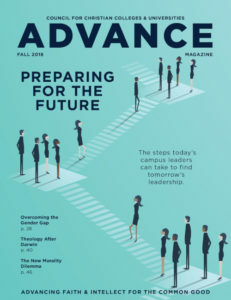 So how can Christian colleges and universities help prepare the next generation of evangelicals – whether or not they call themselves that – so that they can be ready to engage this changing culture? How does the Gospel shape our teaching, our relationships, our research, our cultural engagements? How are we bringing Christian faith to bear on any of the various disciplines? How are we letting the Gospel be richly and profoundly present in our reflections and activities? The great place and hope of CCCU schools right now is that they might embrace in this season of evangelical crisis a fresh opportunity to use this period of inflection as a chance to re-clarify their central enterprise in light of the Gospel – to articulate where they are and where they aren’t on that road, and how they use this crisis to become freshly committed to the transformative educational and Christian formational opportunity that this very moment offers.